Put A Little Umbrella In Your Drink: Technology + Organizing = Great Idea! This is probably the best organizing idea I have heard in a long time! I can't tell you how much time I waste searching through bins to try and find something! Mabel's Labels has created a great new label that combines technology with organization! Can't remember where you put your summer clothes or those holiday decorations? 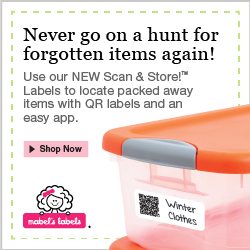 With the new Scan & Store labels from Mabel's Labels, you will never misplace your items again!